The TERRA RAKE is available in 1.7 m, 2.3 m, 3.5 m and 4.6 m widths as well as a 1.7 m electric trailed option. It is a thorough and effective way of pulling up thatch (natural turf) or smoothing rubber crumb which has gathered and needs separating (artificial turf). The two wider machines have a folding frame which supports two separate same-sized units either 1.7 m or 2.3 m. These can be transported together and ‘joined’ to create twice as much output, the folding mechanism working hydraulically from the operator’s in cab controls. Sturdily built, the Terra Rake is meant for heavy duty use. 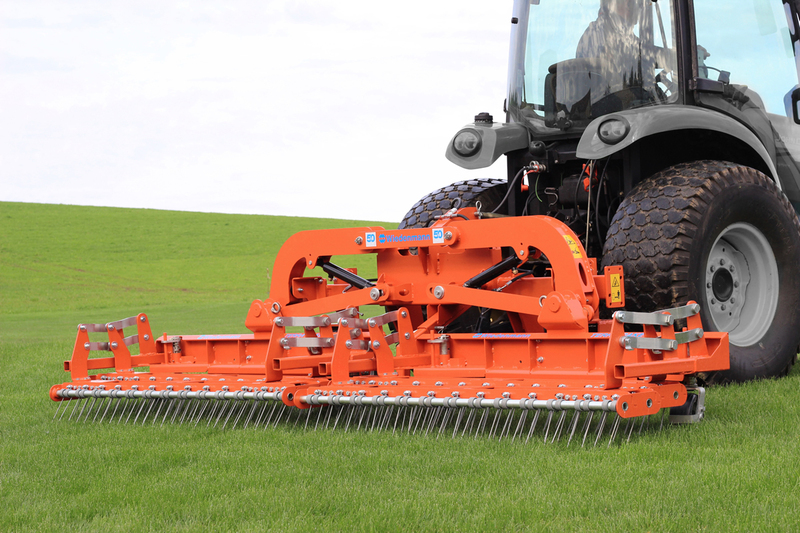 The parallelogram-shaped Terra Rake has a robust steel frame containing closely arranged rows of long verticutting tines. These steel tines are self-vibrating and probe inquisitively. Arranged in four rows just 20 mm apart the tines are designed not to clog but are close enough together to offer a very thorough and rigorous action on the ground. All four models attach to tractors and power units by 3 pt linkage. However, Wiedenmann engineers have created a new 1.7 m Terra Rake trailed draw bar option with electric wheels which doesn’t need linkage attachment so is ideal for utility vehicles and similar. Optional equipment: Road lighting kit, Load relief kit. If you are interested in our TERRA RAKE use the quick enquiry form below.